Siniora giving his speech in Wissam Al-Hassan’s funeral, Nadim Koteich is on his left. Nadim Koteich calls the demonstrators to storm the Grand Serail. Few minutes later, on the ground, Nouhad El Machnouk says that the protesters won’t stop attacking the Serail until the government falls. Half an hour later, Hariri tells his supporters to withdraw from the streets. Geagea and Gemayel quickly imitate Hariri and do the same. Fifteen minutes later, Elias Atallah says that the supporters won’t leave the streets. 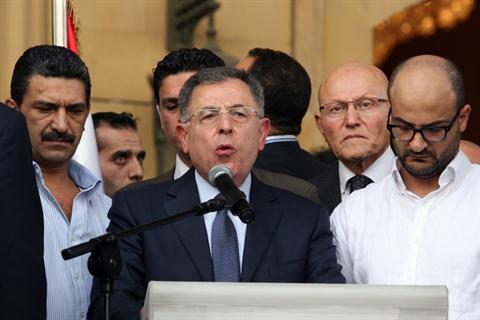 Siniora initially stays silent then calls for calamity. The protesters confused, don’t leave but rather reorganize themselves peacefully. One day later, Mouin Al-Merehbe incite the protesters in Tripoli to start a civil disobedience. Meanwhile, his colleagues in the FM refuse to call for civil disobedience. They rather agree with him on making some demonstrations and on setting tents in front of Mikati’s house. In Tariq Jdide – The Sunni street of Beirut in contact with the Shia southern suburb – military groups loyal to Hariri refuse FM politicians’ calls to go home. Clashes erupt, and the FM, which in a way or another started everything, sees itself – even if symbolically – obliged to abandon the political umbrella it gave to the armed men. The huge stress and the sudden urge of responsibilities that was put on M14 upon Al-Hassan’s assassination shows and confirms what was happening behind the scenes for the past year and a half. Tripoli and North MPs are having a more aggressive and independent tone by the day. The Beiruti and Bekaa MPs are mixing up their decisions . The streets are more and more getting under the control of Islamists. Independent March 14 gathering politicians don’t know what to do while Jumblatt – caught in the middle – accuses Syria and politically clashes with Hariri. Hariri is losing influence among his MPs. Hariri’s MPs are either losing their influence in the streets or getting more independent. Geagea and Gemayel are watching with confusion which seems like a disintegration à long terme of the FM and a rise of Islamists. This is clearly affecting March 14’s General Secretariat. Hariri’s self-exile wasn’t such a smart idea after all. The demands might still be the same, but when it comes to the means, M14 politicians stand on a crossroad. The lack of a strong unified functional command is getting clearer by the day. Do not only look at the symbolic M14 – suggesting a common stand – gathering on Saturday in Beit Al Wasat. En theorie n’est pas en pratique. Posted in 14 March Alliance, Lebanese Politics, Politics, Saad Hariri, Wissam Al Hassan on October 26, 2012 by Ramez Dagher.